• U.C. Santa Barbara head coach Andrew Checketts utilizes an innovative system that tracks everything a pitcher does which could result in pain, potential surgery. 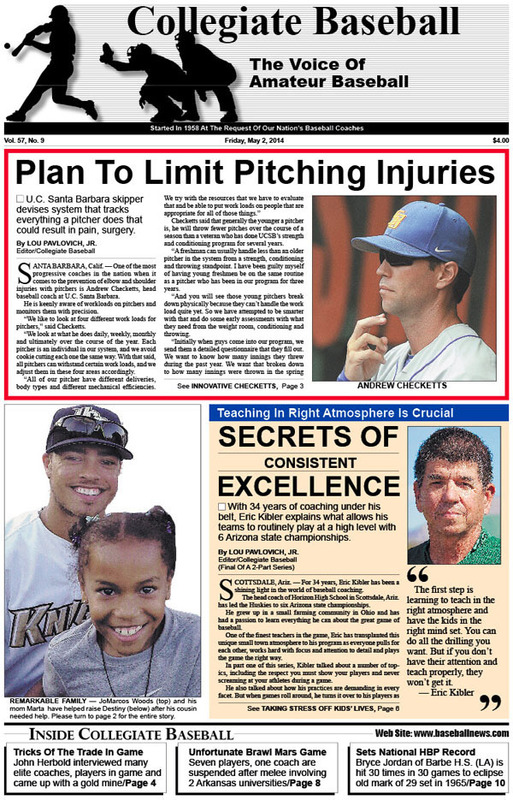 • Secrets Of Excellence Part 2: Eric Kibler delves into this intriguing area and offers his wisdom and experience in becoming a great baseball coach. •Editorial: When it cheating OK in game of baseball? The art of purposely being hit by pitches. • John Herbold’s quest for knowledge never ended as he compiled a treasure trove of interesting ideas, concepts. • NCAA Division 1 Notes: Seven players, 1 coach suspended after wild brawl between Arkansas-Little Rock and Central Arkansas. • Louisville Slugger National Players of Week: Six players put up mammoth numbers including 16 strikeouts by one pitcher. • Collegiate Baseball’s National High School Poll: Lambert (Suwanee, Ga.) ranked No. 1 with 23-0 record. • High School Notes: Barbe’s Bryce Jordan sets high school national record after being hit 30 times in 30 games. • Ruleball With Rich Marazzi: When fielders lay on runners, obstruction is next. • NCAA Division 2 Notes: RHP Tyler Badamo of Dowling doesn’t allow an earned run in 52 2/3 innings. • NCAA Division 3 Notes: Gallaudet’s Casey Hicks belts 4 home runs, 15 RBI during 6-game stretch..
• NAIA Notes: Lewis-Clark State’s senior Tariq Staton hits his first home run in grand style. • Tom Kovic: For prospects, summer can be utilized to enhance opportunities. • Charlie Greene: Studying great Dizzy Dean shows silky smooth delivery. • Junior College Notes: Seward County pulls off rare triple play against Frank Phillips College. • Douglas Drewyer: Change is one thing we can always count on. To order the May 2, 2014 edition of Collegiate Baseball or subscribe, CLICK HERE.